After tread and post installation, we move on to installing the railings and balusters. The railings by themselves are not that hard, but fitting the balusters and getting everything to line up is a little more difficult. Follow these steps for a successful and good looking installation. Installing a stair railing between two posts doesn’t seem that hard and it isn’t. Measure carefully, cut the right angle and screw the railing to the posts. Let’s not forget the balusters however. Every step needs at least two and some building codes require three. Let’s take a look at a stair railing installation. Verify all your posts are plumb (vertically level). Clamp the railing to the post sides at the correct height. Make a mark on a 4-foot level at 31 1/4 inches. Stand the level at tread nose and center the bubble. The mark should align with the bottom of the railing. Verify again that the posts are plumb and use the side of the post as a marker to scribe your cut line on the railing and use the railing to mark the bottom location of the railing on the post. Cut the railing on a miter saw but leave it slightly long. This gives you the opportunity to adjust the angle slightly if necessary and fine tune the cut until it’s perfect. Don’t force the railing to fit between posts and push them out of plumb. Adjust the railing cut to fit right and the finished job will look better. Drill countersunk pilot holes at each end of the railing and into the post. You will have to plug these holes later. Add lag screws to hold the railing in place, but don’t sink them all the way in yet. Layout the balusters on the steps so they are evenly spaced on each step and from one step to the next. Don’t forget about the tread overhangs as they can get in the way if you’re not careful. To be consistent, mark a small board with the baluster locations for one step and use it to mark all the steps. Mark the baluster locations on each step on a line centered on the newel posts. Transfer the baluster locations to the railing with a level. Place the edge of the level at the mark on the tread, center the bubble and mark the railing side. Make a guide block as shown for drilling the baluster mortises in the railing and drill all the mortises in both the railing and the steps. If the tenons that fit into the tread or railing are square, use a chisel to square the holes. Number each mortise in the steps. Each of the balusters on a step is a different length and lengths may vary slightly between steps. Each baluster must be measured, cut to fit and numbered so it is put in the right location. Cut all the balusters and fit them into place under the railing. Verify the railing is not bowed, the balusters all fit and everything looks good. Take your time–this is your chance to fix problems before the final assembly. A helper will make this part easier. Being quick is important, but so is being accurate. Disassemble the test fit railing from the balusters and the newel posts. Place a dollop of construction adhesive in the baluster mortise on each step, but not the railing. Spread a small amount of adhesive on the tenon of each baluster and set it into the hole–match the balusters to the correct holes using the numbers and immediately wipe up any adhesive that squeezes out. Apply yellow wood glue to the ends of the railing. Set the railing loosely on the newel post tenons and begin fitting the baluster tenons into the railing mortises beginning at one end and working towards the other. After you fit all the balusters into the railing, look over the installation to make sure it looks good. This is your last chance to make any adjustment before the adhesive sets. Make sure the balusters are aligned on the centerline on each step. Balusters with square bottoms and round tenons may not be square to each other or centered correctly–rotate them to make them square or center them. Look for and wipe glue squeeze out you may find. Plug the screw holes with matching wood plugs and cut off the ends. Give everything a final sanding and the stair railing installation is ready for finishing with stain. A staircase can be the focal point of a room or entryway and you want to show it off. Architects often place the main stairway of a home near the main entrance so it can be seen. With patience and attention to detail, you can build your own finely crafted staircase yourself. 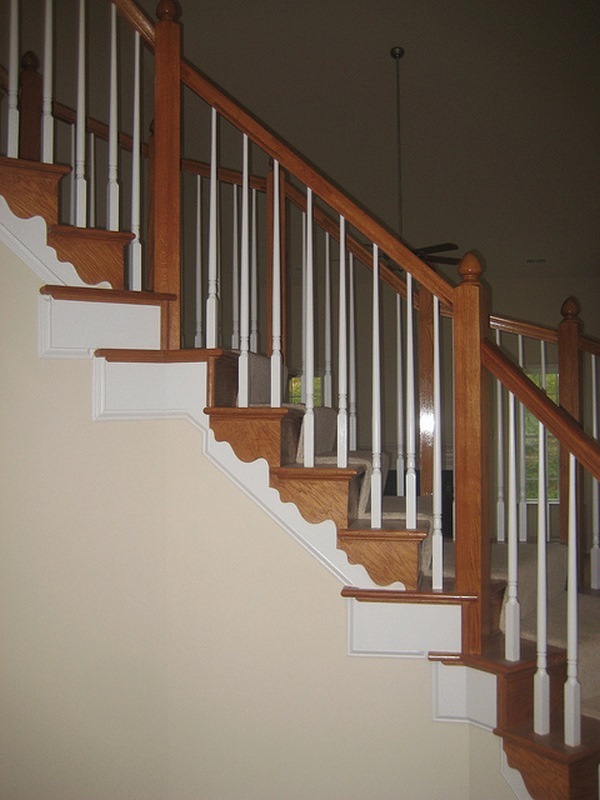 Thanks for your comment on how balusters help the staircase stay lined up. I didn’t know that architects normally put the grand stairway near where you normally enter your home. I loved your tips, and since my husband and I work all day, we will most likely look into finding a professional to install new stairs and balustrades in our main foyer.